Ralf Hutter (left) and the other members of Kraftwerk in performance at the Museum of Modern Art in New York on Tuesday. Ralf Hutter (left) and the other members of Kraftwerk in performance at the Museum of Modern Art in New York. Imagine an era when mainstream music wasn't filled with synthesizers. When electronic music wasn't a force propelling everything from pop and hip-hop to music from the underground. There was a time when this world existed. Then Kraftwerk emerged, and the world we knew changed. This week, the group that many say started it all began playing a series of eight concerts at the Museum of Modern Art in New York. 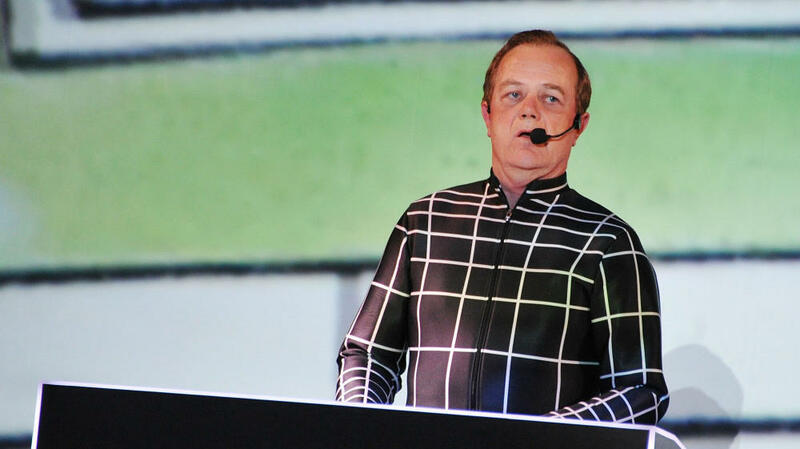 Each performance highlights one album from Kraftwerk's career, but the format for each is the same: Four men, wearing tight black bodysuits gridded with white lines, stand behind four podiums in MoMA's Marron Atrium, manipulating synthesizers while a huge 3-D projection glows behind them. It looks like a scene from a future conceived in the 1970s, which, in some ways, it is. On Tuesday night, the more than 20-minute-long title track from Kraftwerk's groundbreaking 1974 album Autobahn pumped through speakers. Only one of the four men onstage — co-founder Ralf Hutter — is an original Kraftwerk member, but the sound is undeniable, says fan Tom Przyborowski, who has seen various incarnations of the group six times over the years. "Any dance producer — electro, house, techno, acid — any of these producers, when you read an interview about who their influence is, they always say Kraftwerk," Przyborowski says. Ask some of techno's biggest names, and you'll get confirmation. "Definitely, Kraftwerk was a major influence on some of my first professional recordings," says Juan Atkins, one-third of the Belleville Three, who laid the groundwork for Detroit techno, and a member of Cybotron, one of the genre's most influential groups. Atkins remembers hearing Kraftwerk on the radio in Detroit when he was young. 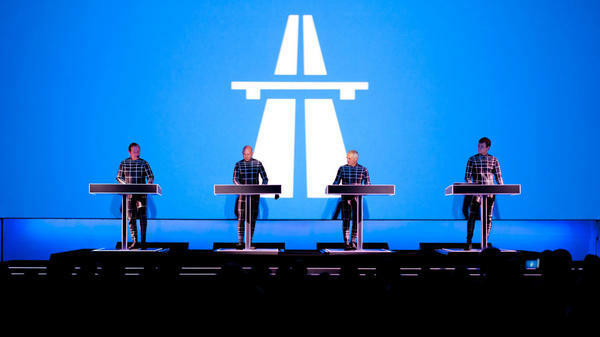 "It was gated noise," Atkins says, referring to the sounds Kraftwerk shaped with synthesizers. "I heard those sounds and I'm like, 'Wow.' "
Hearing Kraftwerk for the first time shaped the musical development of the young Richard Hall, who would grow up to record as Moby. "I almost had one of those tectonic shifts where I was like, 'Oh, I can see myself devoting my life to electronic music,' " he says. And he did. But as Moby points out, that task is much easier today than it was when Kraftwerk started. "In the '70s, making electronic music involved really difficult, temperamental, expensive pieces of equipment that didn't sync up with each other and were really hard to work with," he says. "As a result, it makes Kraftwerk's accomplishment even that much greater." There were other bands using synthesizers at the time, but Kraftwerk was the one that caught on — though not at first. Formed in Duesseldorf, Germany, by Hutter and Florian Schneider (who left the group in 2008), Kraftwerk released its first album in 1970, but it wasn't until their fourth, Autobahn, that the group had a hit. That's because they managed to do more than just make technologically advanced sounds, says Harvey Bassett, also known as DJ Harvey. "They're very accessible. They're the complete package," Bassett says. "Some of the pioneers were the musical equivalent of social cripples and were unable to put on a show, whereas Kraftwerk, in the mid-'70s, had everything going for them. They were stylish, mystical, futuristic and had a pop sensibility that touched children and intellectuals alike." And, famously, to blacks and whites alike. Kraftwerk's music was first heard by many after it was sampled in early hip-hop records. Wired staff writer Geeta Dayal points to a photo of the band playing at the Ritz in New York in 1981 as evidence of its crossover. "There's this amazing black-and-white photo that's been circulating around the Internet which shows the entire front row, and it's like 75 percent black," Dayal says. "It's part of the strength and enduring longevity of Kraftwerk that it was an incredibly diverse crowd." Afrika Bambaataa was reportedly in that crowd, and just a year later, he and fellow hip-hop pioneer Arthur Baker combined the beat from Kraftwerk's "Numbers" with the melody from "Trans Europe Express" to create "Planet Rock," one of early hip-hop's defining tracks. 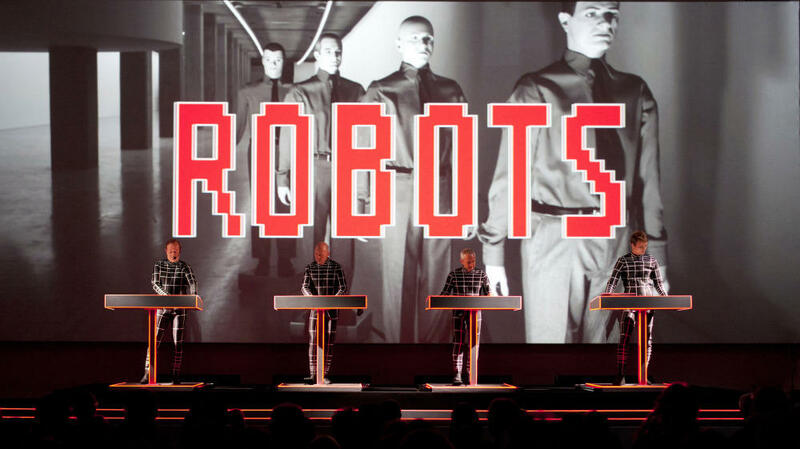 While Kraftwerk laid the groundwork for the sound of the future, there was a fear — perhaps due in part to the group's accessibility — that electronic synthesizers would replace musicians. "I remember having a sticker that said 'Keep Music Live,' and it was printed by the musicians' union and it was an anti-synthesizer movement," says Bassett. "And I think Kraftwerk sort of legitimized the synthesizers. Like, 'OK, this isn't a threat, it's actually a new realm.' "
But Bassett warns not to take Kraftwerk's vision of the future too seriously. "There's a Mona Lisa smile put on the whole thing, and I'm guessing they're having a giggle all to themselves," he says. "It's not a joke, but there's definitely some fun to be had." "Growing up in suburban Connecticut," Moby says, "I'd be sitting in my suburban bedroom listening to The Man Machine or Trans Europe Express and imagining this world that was thousands of miles away and involved erudite Teutonic Germans making tea and playing around with analog synthesizers and, you know, discussing Schopenhauer or maybe, like, taking a train with Iggy Pop and David Bowie and going out dancing all night in Berlin 'til seven o'clock in the morning." Mainstream music today is filled with synthesizers and electronic dance music has become a driving force behind both pop and hip-hop. Well, this week, the Museum of Modern Art in New York hosts the group that many say started it all, Kraftwerk. NPR's Sami Yenigun reports on the German band's broad influence. SAMI YENIGUN, BYLINE: Four men wearing tight, black body suits gridded in white lines standing behind four podiums manipulating synthesizers with a huge 3D projection glowing behind them. It looks like a scene from the future. Well, a future conceived in the 1970s. YENIGUN: "Autobahn," the 20-plus minute title track from Kraftwerk's groundbreaking 1974 album, pumps through the speakers. Only one of the original members of Kraftwerk is on stage, Ralf Hutter, but before the show, fan Tom Przyborowski, who's seen various incarnations of Kraftwerk six time over the years, says the sound is still fresh. TOM PRZYBOROWSKI: Any dance producer or electro, house, techno - when you read an interview from them, the first influence they've ever had, they always say Kraftwerk. YENIGUN: Really? OK. Let's ask one of techno's creators. JUAN ATKINS: Well, definitely, Kraftwerk was a major influence over some of my first professional recordings. YENIGUN: That's Juan Atkins, one-third of the Belleville Three, who laid the groundwork for Detroit techno. Atkins remembers hearing Kraftwerk on Detroit radio when he was young. ATKINS: And, basically, all it was was gated noise. If you can gate and filter noise the right way, you can get a kick drum sound, hi-hat, snare sound. And I heard these sounds on this Kraftwerk record and I'm like, wow. YENIGUN: Gated noise, that sound shaped by a synthesizer. YENIGUN: One of today's best known electronic musicians goes even further when talking about first hearing Kraftwerk. MOBY: I almost had one of those tectonic shifts where I remember sort of thinking to myself, like, oh, I could see dedicating my life to electronic music. YENIGUN: Richard Hall, better known as Moby, says making electronic music today is a lot different than it was in Kraftwerk's day. MOBY: In the '70s, making electronic music involved really difficult, temperamental, expensive pieces of equipment that were just really hard to work with. And, as a result, it makes Kraftwerk's accomplishment even that much greater. YENIGUN: There were other bands using synthesizers at the time, but Kraftwerk caught on. Founded in Dusseldorf, Germany by Ralf Hutter and Florian Schneider, Kraftwerk released its first album in 1970, but it wasn't until their fourth record, "Autobahn," that they musicians had an international hit. That's because they managed to do more than just make technologically advanced sound, says Harvey Bassett, also known as DJ Harvey. HARVEY BASSETT, D.J. HARVEY: They're very accessible. They're the complete package, I suppose. You know, I think maybe some of the pioneers were perhaps the musical equivalent of social cripples and were unable to put on a show, whereas it seems like Kraftwerk, especially by the mid-'70s, had everything going for them. They were stylish, mystical, futuristic and had a pop sensibility that touched children and intellectuals alike. YENIGUN: And blacks and whites. Geeta Dayal, staff writer at Wired magazine and longtime Kraftwerk fan, points to a picture taken at a Kraftwerk performance at the Ritz in New York in 1981. GEETA DAYAL: Which shows the entire front row and it's like 75 percent black. That's part of the strength in the enduring longevity of Kraftwerk is that it was an incredibly diverse crowd. YENIGUN: ...to create "Planet Rock," one of the defining tracks of early hip-hop. YENIGUN: While Kraftwerk wound up setting the groundwork for the sound of the future, back in the 1970s, there was a fear that electronic synthesizers would replace musicians, says Harvey Bassett. HARVEY: I remember having a sticker that said Keep Music Live and it was printed by the Musicians Union and it was like it was an anti-synthesizer movement and I think Kraftwerk sort of legitimized the synthesizer in many respects. It's like, OK, this isn't a threat. It's actually a new realm. YENIGUN: But he cautions not to take Kraftwerk's futurism too seriously. HARVEY: There's a Mona Lisa smile put on the edge of the whole thing. And I'm sure they're having a little giggle all to themselves and, you know, it's not all a joke, but there's definitely some fun to be had. YENIGUN: Robots from the future playing synthesizers seen through 3D glasses. Sounds like a good time to me. Sami Yenigun, NPR News. Transcript provided by NPR, Copyright NPR.